About: The company's UK showroom displays more than 200 fires and fireplaces. 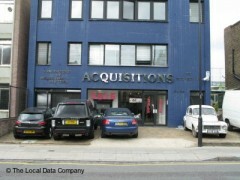 Acquisitions is actively looking to export "the English look" worldwide. They also supply their period fireplace "continuations" to all four corners of the world, with 400 outlets in the UK alone and through partnerships with several foundries. Gas, coal and log effect fires are available here.